Antique Copper Leader-head collector Box -set Of Two! 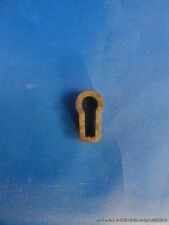 VINTAGE SKELETON KEY 3 3/16" LONG NICE! The information I give is based on general knowledge and information passed down by previous owners / internet research.It i s hard to be precise regarding a keys age or history so I never sta te the age. Excellent quality vintage style toilet engaged/ vacant door set ( the whole complete set ) finished in brass and is a heavy good quality new set and isn't one of the thin metal ones . This comes with all the fixing screws as well . The Main lock body is 63mm wide X 38mm with bolt protruding 19mm and bolt sleeve is 15mm wide X 38mm tall and engaged/vacant plate is 40mm wide X 60mm tall . Will be posted quickly . To the Lighting During Photo Shooting or the Monitor's Display. Blade height: 7.5mm. 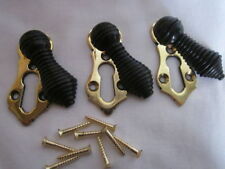 A brass plated 6.3 cm x 3 cm Cupboard / wardrobe lock with 2 keys and fixing screws. 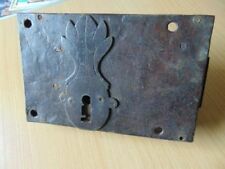 INCLUDING ESCUTCHEONS- HAT/COAT HOOKS-DOOR KNOBS-LETTER BOXES-KNOCKERS-GLASS CUPBOARD KNOBS-VARIOUS BACKPLATES/ROSES. Edge to hole centre 75mm. The (approx.). what you're looking for, get in touch I may be able to help. Save Save Save Save Save Save. Length of key Escutcheon. 4 cm. You attach this to the door by attaching the back panel. Then slide the lock onto this. this is so no screws are visible from the front. The slide lock is at the bottom. And which way round the latch/catch bolt is ON YOUR DOOR?.as I really don't mind helping you out so that way the lock is ready for you to fit as soon as you receive it. This lock dates from around the 1930's era and it is in good working order and in very good condition for its age. Key Length:5.8cm. Material:Zinc Alloy. Color:As The Picture Show. Screws Supplied. Main Lock Body: 30mm x 45mm. KW1-KW17, PA20-PA38, PA41-PA49, PA60-PA78, PH4-PH44, PH49-PH50, PO (Isle Of Wight) TR (Isles Of Scilly) ZE (Channel Isles). AB31-AB38, AB40-AB56, BT (Northern Ireland) GY, HS, IM (Isle Of Man) IV1-IV28, IV30-IV32, IV36-IV49, IV51-IV56, IV63, KA27-KA28. 7 Old Reclaimed Iron Rim Locks. In original uncleaned condition with no keys. Hopefully of use to someone. Any other questions please ask. Thanks for looking. Bulk Lot Antique Brass & Steel Padlocks Various Sizes Shapes 15 Keys​ A small collection of 13 antique padlocks, 11 are brass, and 2 steel. The largestr measures 4.5cm x 7cm, to the very smallest 1.75cm x 2.5cm. 5 of the padlocks have keys, the remainder no keys. 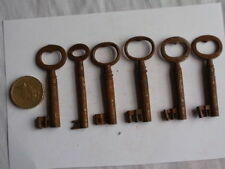 Also in this lot is 15 small old padlock keys, measure 2cm up to 3.5cm. I've taken numerous close-up photos so you can see the details, back and front. Will send overseas but please contact me before bidding for postage rate, the package will weigh approx. 750 grams Thanks for viewing. Save Save Save Save Save Save Save Save. To the Lighting During Photo Shooting or the Monitor's Display. ~Davenport ~. Cast Iron & Brass Rim Lock. with 2 Brass Keys. The distance from the spindle is 5"mm to the edge of the door. It's unique design makes it. and weighs 1kg. are approx 6.1/2" x 5"& the keep is 1" x 5". From a very large collection of keys, assembled over many years. ALL HAVE VERY DECORATIVE PATTERNS. A GOOD LOT FOR THE COLLECTOR OR FOR SPLITTING DOWN AND RE-SALE. THEY ARE ALSO SUITABLE FOR USE IN JEWELRY PROJECTS. Even though this lock has just one lever, it is still fairly secure because it has a profile inside the lock on both sides of the lock case around the keyhole where the key must have this bit cut out on both sides of the key flag so that the key can turn and operate the lock, if the key does not have this certain part cut out on both sides of the key flag then the key won't even turn in this lock full stop. 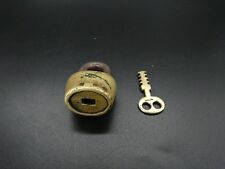 1 x Brass body, working with original key, stamped Lever made. ☆ Perfect For All Small Boxes. Make Your Box Lockable . ☆ Spare Keys Available. Colour: Gold. make Supersized seem small. 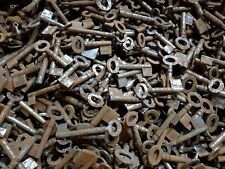 Here I have a huge joblot of various old keys, locks and padlocks. These were in my grandfather's workshop and are clearly of some vintage. There are various old brass cabinet/furniture locks, a few with keys attached but mostly without. There must be several hundred various old keys for all manner of things from old front doors to old furniture and I think there are even some old car keys in there. There are also some old padlocks, again some with keys and some without. Please look at the photos for a better picture on what is there. You are welcome to collect from West Kingsdown, close to Brands Hatch. Any questions please just ask. Please check out my other items. Supplied complete with key and brass edged keep. A lovely old rim lock which dates from the Victorian era. Distance from front edge of lock to centre of key hole - 62mm (approx.). Distance from front edge of lock to centre of spindle hole - 122mm (approx.). THIS LOCK CAN BE USED FOR A LEFT OR RIGHT HAND DOOR. Collection of assorted Antique Vintage chest and cupboard Keys. Some with old handwritten labels. Dispatched with Royal Mail 2nd Class. There are four matching locks (without keys), also three matching locks that have SECURE 4 LEVER 1934 THE MANUFACTURE OF JOSIAH PARKES & SONS UNION WORKS WILLENHALL ENG stamped on them (without keys), and the other locks are not matching. Quantity: 9pcs/set. Color: As the picture shows. A FEW POSSIBLY LATE VICTORIAN. FOR SALE AS A SINGLE JOB LOT WITH NO RESERVE OTHER THAN THE STARTING PRICE. 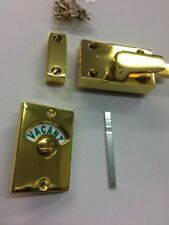 4 BRASS COLOURED CUPBOARD / WARDROBE LOCK WITH 4 KEYS AND SCREWS. 4 BRASS COLOURED CUPBOARD / WARDROBE LOCK WITH 4 KEYS. Each lock measures 2.5 inches high including the base plate and 1.25 inches wide. Please note they are not antique/vintage - I bought them about 10 years ago. Please note, the price is for all four locks. Dispatched with Royal Mail 2nd Class. Please have a look at my other eBay listings too. 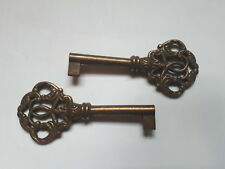 Collection Of Small Vintage Keys For Cabinets/drawers . Dispatched with Royal Mail 1st Class. Even though this lock has just one lever, it is still fairly secure because it has a profile inside the lock on one side of the lock case around the keyhole where the key must have this bit cut out on both sides of the key flag so that the key can turn and operate the lock, if the key does not have this certain part cut out on both sides of the key flag then the key won't even turn in this lock full stop. Cabinet,furniture Lock,jewellery,crafts. 4 barrel 1 Skelton. great bunch to add to your collection. not sure if exact age but Old. All are cleaned by hand. Part cleaned. Brass Draw/Cabinet Lock And Key. Arts & Crafts. I do not know the exact dates of these key. Georgian Wrought Iron Door Lock / Latch. Victorian Architectural Antique. 1.5" knob width. Stamped ETAs 500. It is in good condition and in full working order. Unlock a piece of history and find the perfect fit for your collection with an intriguing and varied selection of antique keys and locks. A popular collectors' item, antique keys and locks can have historical and cultural significance, be an example of the craftsmanship and engineering of the day and hold interest for their distinct shape and design. People also like old keys to wear as jewellery or to display in a home or other type of building and they are a particularly popular feature of the Steampunk trend. Keys also hold symbolic value in some cultures, representing the unlocking of secrets or hearts, for freedom and are popular gifts, particularly for landmark birthdays. You can find your ideal key and lock by choosing from your preferred era or design style. Keys and locks can be found from the Georgian, Victorian, and Edwardian periods, as well as different styles such as Art Deco, Gothic and Arts and Crafts styles. Gothic keys and locks are typical of the Mediaeval-style and are elaborate in design, often with decorative patterns, and inspired by Gothic architecture. A Gothic lock stands out for its quadrilateral shape and decorative foliage around the keyholes. A collector looking for a key from the Georgian era will come across large iron keys with rounded or flat bows. Sometimes more ornate keys from the period can be found with decorative bows and shafts, which will add interest to any collection. In the Victorian era, there was a demand for more secure locks and there was a boom in the manufacture of key and locks. Look out for keys made from durable iron or cast iron, or brass and locks engraved with the place of manufacture (often towns and cities such as Willenhall and Wolverhampton) and locks designed by the inventors of the day such as Jeremiah Chubb. With diverse and interesting styles of antique keys and locks available, a collector is sure to find the one they are looking for.